Hi lovelies! I have a bit of a different post for you all today as I wanted to show you something super adorable that I was sent recently! As many bloggers know, we often get things sent to to us to try out and as lovely as it is to receive clothes and beauty products for myself, nothing really excited me more than getting sent adorable items for my dog. This time, Belle has a brand new piece of jewellery (a collar tag) to show you all! 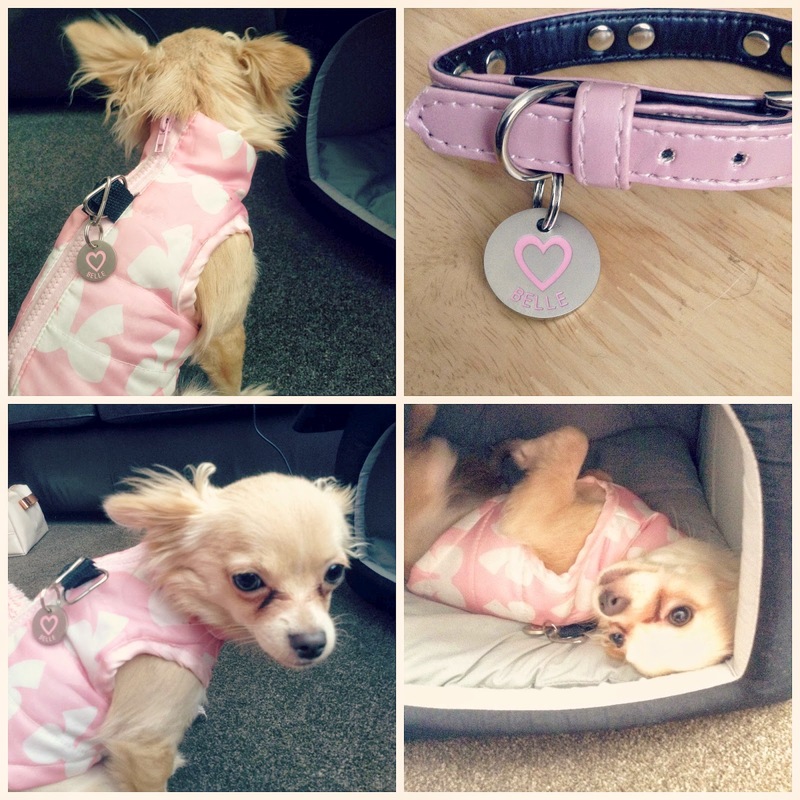 This is from a website called collarsandtags.co.uk, they do very inexpensive, adorable personalised pet tags for your little darlings! I chose the Deep Engraved Heart tag as these deep engraved pet tags should last a long time without fading. It feels like fab quality but isn't too heavy, which is great as Belle is only very teeny tiny! Being a Chihuahua, Belle wears a harness for walks as collars can pull on their tiny necks too much when a lead is attached, but I do sometimes like her to wear a collar too, both for identity and adorableness! These tags can be attached to a harness hook too though, as I've shown in the picture above. I think tags like this are a great idea, as you can put your address or phone number on the other side, just for that bit of extra security, particularly if you let your dog off the lead on walks (which I don't, as Belle can't really be trusted!!). What do you think? Do you think tagging your pets collars/ harnesses is important? Or do you just simply like the idea of a cute little accessory to add to their collar or harness? Ah that tag for Belle is so cute! I got my first dog about a month ago and I love spoiling her with cute gifts <3 I'm a new follower and cant wait to see more pics of your pup!